St. Paul, MN (April, 2019)–Bees are critical members of the ecosystem: 75% of leading food crops have some level of dependency on pollinators. However, native bee populations are struggling because of loss of habitat and food, often caused by urban and suburban development. The good news is that a single tree or shrub can produce thousands of flowers with high-quality pollen and nectar, providing bees with the protein and carbohydrates they need to thrive. 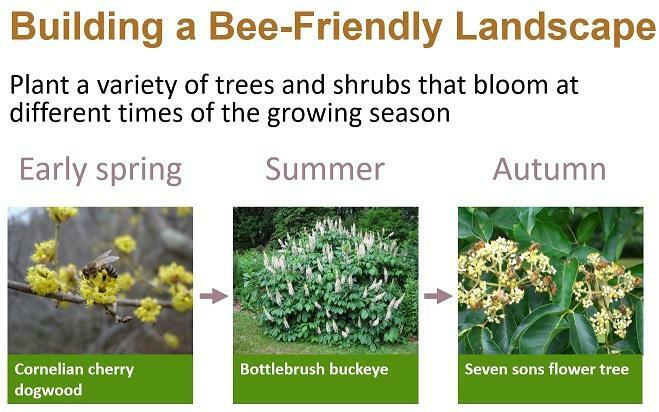 Both native and non-native plants attract diverse communities of bees, and non-native plants can extend the flowering season. Flower form matters. Plants that are horticulturally modified for aesthetic reasons, such as flowers with double petals, don’t attract bees. Many of the best bee-magnet plants are pest free, which is attractive to homeowners. Potter ends his presentation with a list of the best woody plants and recommendations for building a bee-friendly landscape. He suggests planting a variety of trees and shrubs that bloom at different times of the growing season–such as a cornelian cherry dogwood that blooms in the early spring, a bottlebrush buckeye for the summer season, and a seven sons flower tree for the autumn–to provide crucial floral resources through the winter. Other recommendations can be found in the webcast. This 19-minute webcast is part of a module in the new Pollinators Hub on the Plant Management Network (PMN). The module includes a webcast, summary webcast, podcast, slide set, and study guide. PMN is a cooperative, not-for-profit resource for the applied agricultural and horticultural sciences. Together with more than 80 partners, which include land-grant universities, scientific societies, and agribusinesses, PMN publishes quality, applied, and science-based information for practitioners.